(b. Santurce, Puerto Rico, 1955). Roche Rabell began his formal artistic studies at the Luchetti School with Max Lop and continued at the School of Architecture at the University of Puerto Rico, Rio Piedras where he studied architecture, design, and illustration. (1974-1978). He moved to Chicago in 1979 and enrolled at the Art Institute, where he earned a B.F.A. and an M.F.A. While a student in Chicago he was influenced by the artists Ray Yoshida and Richard Keane, and by the art historian Robert Loescher. Since the late 1970's he has created complex expressionistic paintings, pastels and prints featuring the human figure, often focusing on the facial portraits. His works were included in the Hispanic Art in the U.S.exhibition at the Museum of Fine Arts, Houston (1987), and Latin American Artists of the Twentieth Century at the Museum of Modem Art, New York (1993). The Museo de Arte Moderno in Mexico City held a solo exhibition of his work in 1995. His work is considered neo-expresionist. 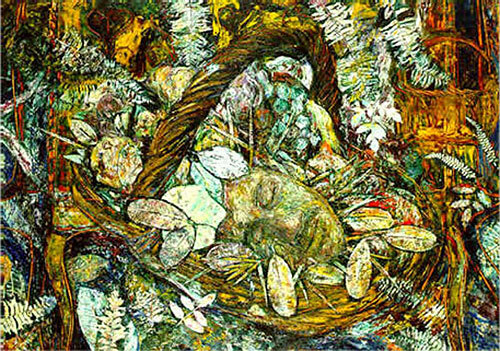 His first mature work dates from the early 1980 and his career is highlighted by making large paintings using a rubbing technique in which he puts objects or persons under canvas and rubs the paint to get a picture impregnated in the fabric. After this process the artist continues to work the picture layer upon layer, thus obtaining a complexity that characterizes the image. In 2005 Spanish writer Mercedes Lizcano spoke to the artist about his current work.